The apse that terminates the Cathedral to the east – beyond the high altar – is lit from beyond the graceful pointed arches by five windows in the ambulatory. The coloured panels are set in tinted glass, a variation which often makes a pleasant change. The first on the left reads (upwards): The Magnificat, the Annunciation, the Visitation, with the virtues of humility, charity and prudence. The corresponding window to the right represents God speaking to Moses from the burning bush, Michael conquering Satan, and the ‘Women of the Apocalypse’, with the virtues of piety, patience and obedience. Inwards from these two, the second window from the left represents St. John the Evangelist, St. Philip Neri, St. Victoria, St. Ethelreda, St. James; the second from the right represents St. Henry, St. Edmund, St. Teresa, St. Margaret of Hungary and St. Vincent de Paul. The censing angels in these two windows are very attractive features. The centre window represents St. Elizabeth of Hungary, St. Anne, St. Joseph, and Our Lady with the Holy Child. These windows were installed during the 1940’s having been brought from the chapel of Derwent Hall in Derbyshire which was owned by the Fitzalan Howard family and which disappeared under the waters of the Ladybower reservoir. In the ceiling above the sanctuary are five carved bosses. From the east end they represent; Our Saviour, the Lamb of God, the Holy Spirit in the form of a dove, Our blessed Lady and finally St. Joseph. Twelve columns support the roof of the Apse and above each of the eleven arches are two roundels. Those on the north side represent the holy men of the Old Testament; patriarchs, priests and prophets in the following order; the first roundel nearest the nave being Adam, then Abel, Noah, Abraham, Moses, Aaron, Eleazar, David, Nehemiah, Zechariah and Mathathias. On the south side are roundels of Popes, martyrs and confessors of the Christian Church. Starting from the nave they are Pope Pius IX (the reigning Pope during the time of the construction of the church), St. Thomas of Canterbury, St. Anselm, St. Ambrose, St. Augustine, St. John Chrysostom, St. Basil, St. Athanasius, St. Gregory the Great, St. Alban and St. Eleutherus. Holy, Holy, Holy, Lord God Almighty, who was, who is, and who is to come. Blessing and glory and wisdom and thanksgiving, honour and power and strength to our God for ever and ever, Alleluia. Amen. A cathedral receives its name from the Latin cathedra, a chair – and the chair in question is the bishop’s seat from which he presides at worship and teaches the people. This can be seen in its elevated position with canopy at the right of the sanctuary. The handsome stone altar, enriched with delicate tracery in the late Gothic style, was consecrated in November 1971 by Bishop Michael Bowen, then Bishop of Arundel and Brighton. The present position of the altar reflects liturgical changes introduced after the Second Vatican Council in the 1960’s. The two ambos or pulpits on either side of the sanctuary are built of Bath stone. The gospel side (i.e. 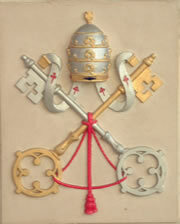 north) is emblazoned with the Papal insignia and the epistle side (i.e. south) with the arms of the Earl Marshal (an office held by the Duke of Norfolk), showing his batons of office crossed in saltire behind the shield, and the Garter with the motto of the Order of the Garter: “Honi soit qui mal y pense” – “Shame to him who thinks ill of it”. The arms are surmounted by a ducal coronet. The carved bosses at the intersections of the rib-vaulting overhead represent (from the apse coming towards the nave): God the Father, Christ His Son, The Paschal Lamb, the Holy Spirit (Dove), Our Lady and Saint Joseph.